1 of 4 Heat oven to 450 degrees F. Line a 13 x 9 x 2-inch baking dish with foil. 2 of 4 Place sweet potatoes on a baking sheet and bake at 450 degrees F for 45 minutes or until tender. 3 of 4 Meanwhile, place salmon fillets, skin-side down, in the prepared baking dish. Sprinkle 1 teaspoon of the seasoning evenly over each fillet. 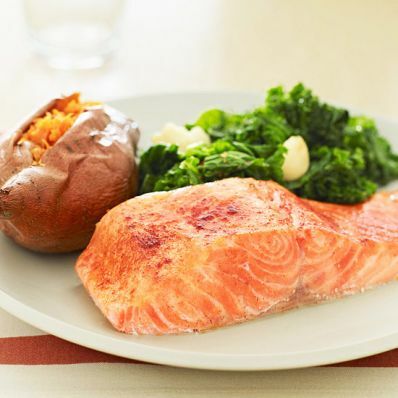 After sweet potatoes have baked 25 minutes, place salmon in oven and bake 15 to 20 minutes or until fish flakes easily. 4 of 4 While potatoes and salmon are baking, prepare kale. Heat oil in a large nonstick skillet. Add garlic and cook 1 minute, until golden. Add kale, salt and red pepper and cook 10 minutes, stirring occasionally, until tender.